When we bought our first home, our decision was almost entirely based on the backyard. The house itself sits on a cul-de-sac and has a very small front yard leaving plenty of room for a large, beautiful backyard. Although the house is only about 12 miles outside of Washington, DC, when you're in the backyard, you would never know we were so close to city living. The backyard is surrounded by huge mature trees and is super quiet. It feels secluded and is perfect for nature lovers like us. Other than all of the memories we've made here, the backyard is the one thing I'm going to miss about this house (okay... and maybe my skinnylap wall 😍). The front yard on the other hand, has always left something to be desired. This post is sponsored by DecoArt. This post may also contain affiliate links for your convenience. For more information, see my disclosure policy. Being on a cul-de-sac, the front yard is pretty small and narrow. When we moved in, the front of the house was lined with huge overgrown bushes that made the yard feel even smaller and made the house feel very traditional. 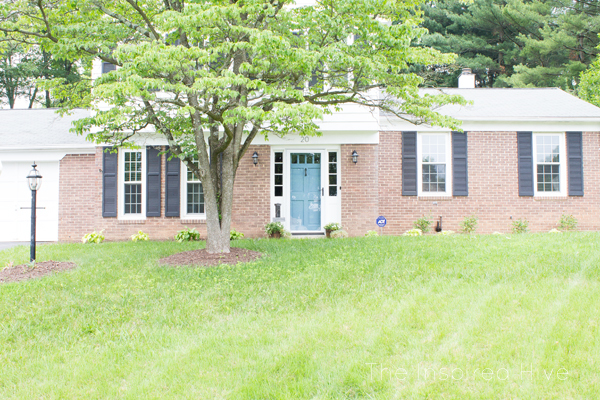 The siding is white with black shutters and the front door was also white, blending in with the siding. Boring! The front yard was something we always planned on tackling, but me being me, I was always distracted by the next big decorating project on the interior, so the outside was always pushed down on our priority list. 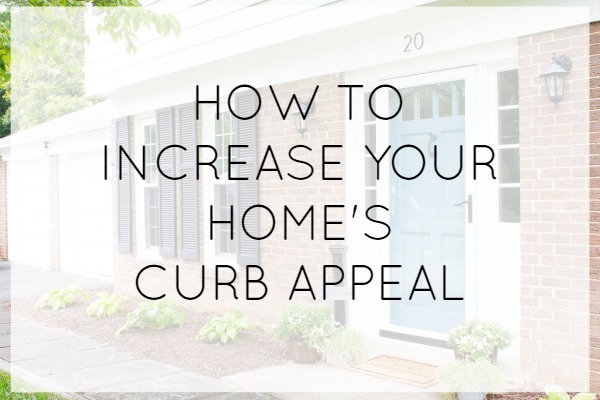 However, when we made the decision to sell our home, we knew we had to do something to increase our curb appeal to attract buyers. 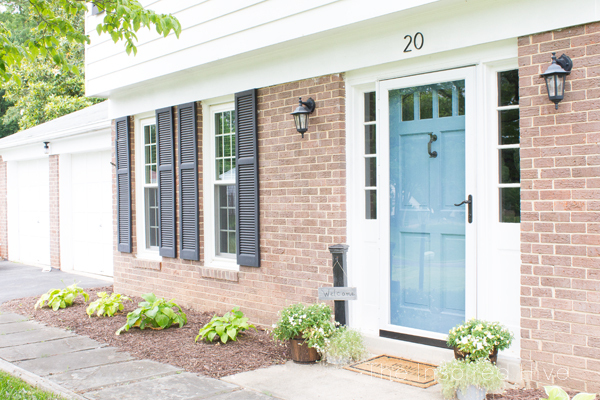 Curb appeal is so important in selling a home. It's the first impression. During the time our house was on the market, I can't tell you how many people drove by and just sat in their cars for a few minutes analyzing the outside of the house. Overgrown bushes don't scream "hey, come tour me!!!!" The goal is to get people to love the outside of your home so that they will want to see the inside. A few small updates had our front yard looking great, but I think the biggest impact on our curb appeal was painting the front door. 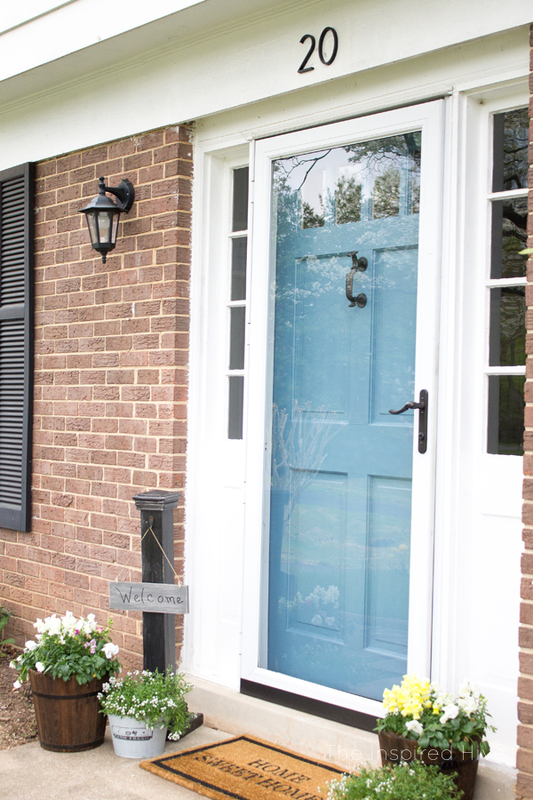 Adding a pop of color with DecoArt's new outdoor line, Americana Decor Curb Appeal paint in "Williamsburg Blue," made our house stand out! 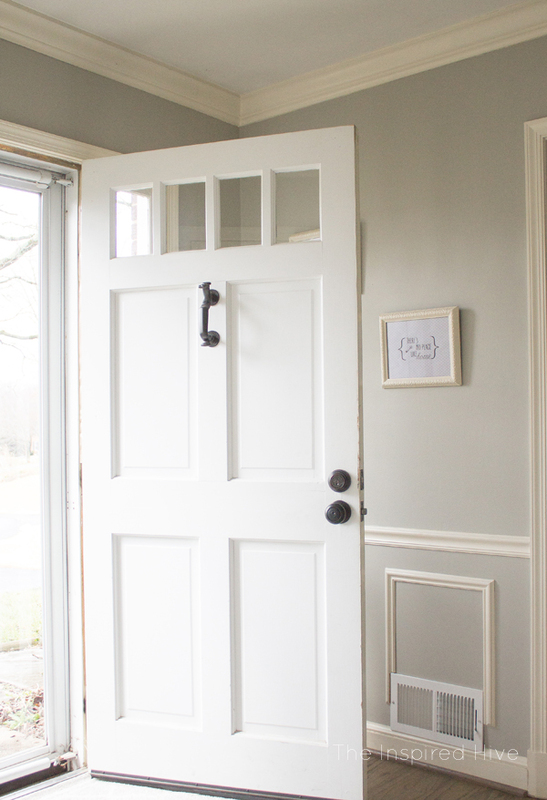 I'm going to share with you how easy it was to paint our exterior door and then share some of the other things we implemented to increase our curb appeal and ultimately, sell our home quickly! Here's what I was working with... An old, white, wooden panel door with a light grille at the top and sidelights on each side. 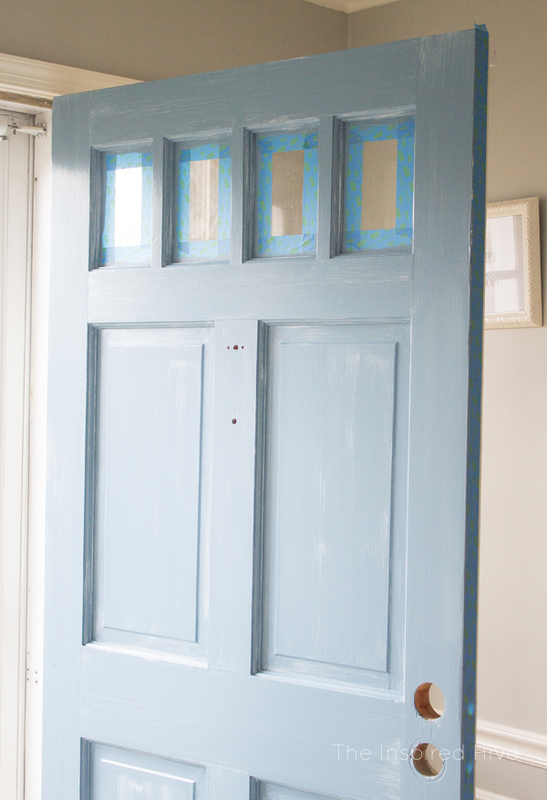 It's a very beautiful, traditional style door, but it needed a makeover! The white on white didn't stand out at all. 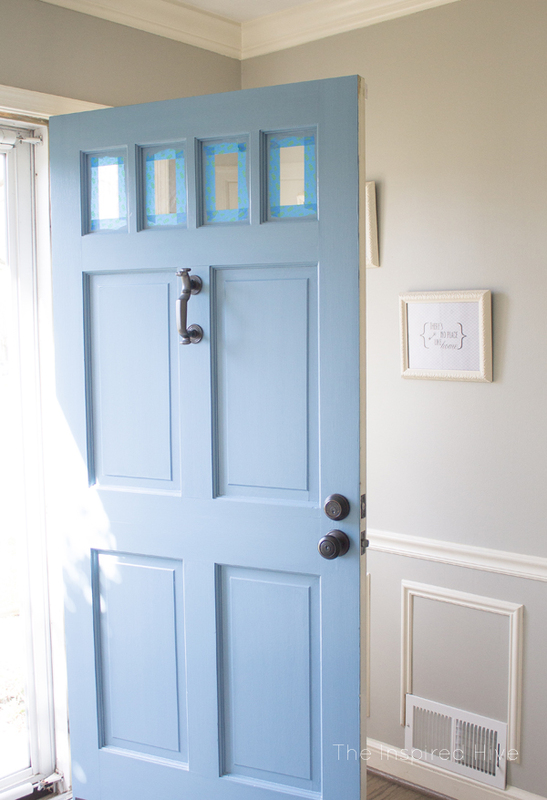 Before painting, evaluate the surface of your door. 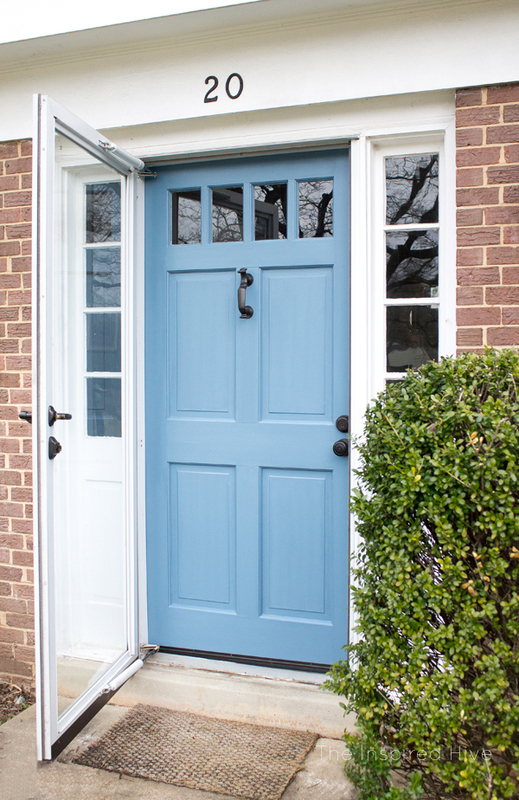 The American Decor Curb Appeal paint doesn't require sanding for proper adhesion, however, if your door has a lot of imperfections or is not a smooth surface, you may want to sand first. It's important to clean the door thoroughly. 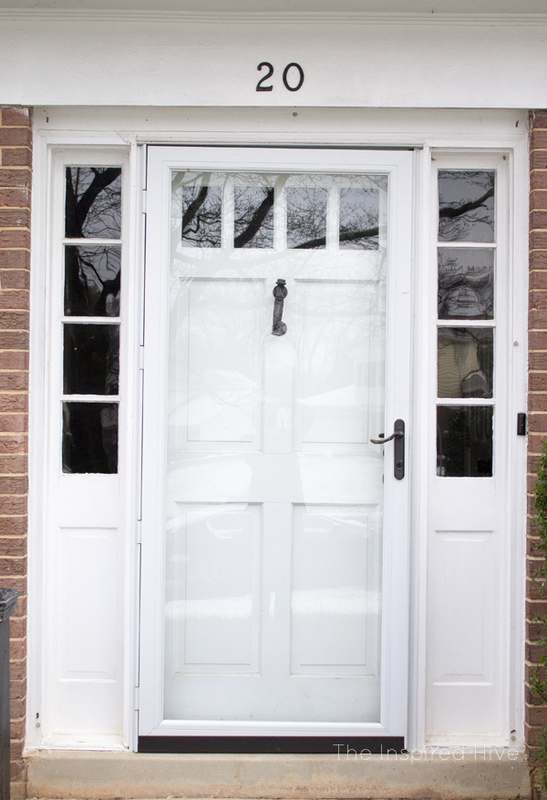 Exterior doors are exposed to the elements and get very dirty, even if you can't see the dirt! Having a glass storm door protecting our door, I thought ours would be relatively clean, but I was shocked at how dirty the water was and how many times I had to get fresh clean water!!! 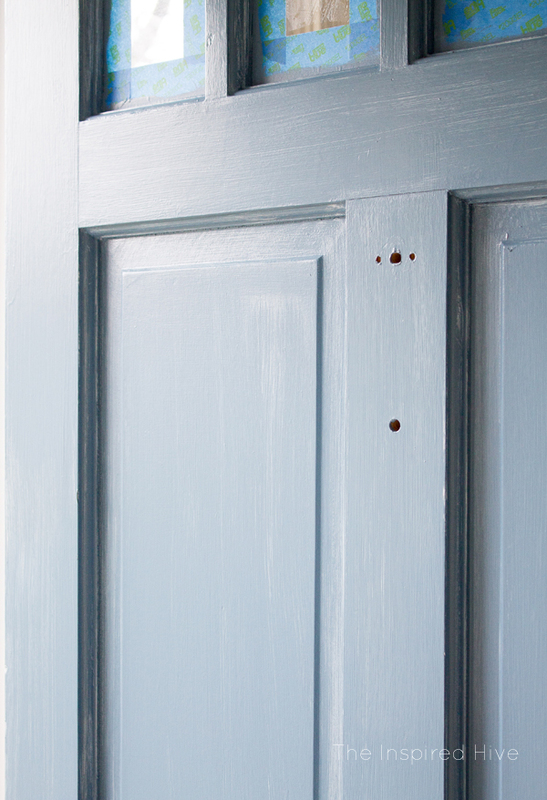 First, remove all of the hardware (door knockers, peep holes, door knobs, deadbolts, etc.). Slide an old towel or drop cloth underneath the bottom of the door. 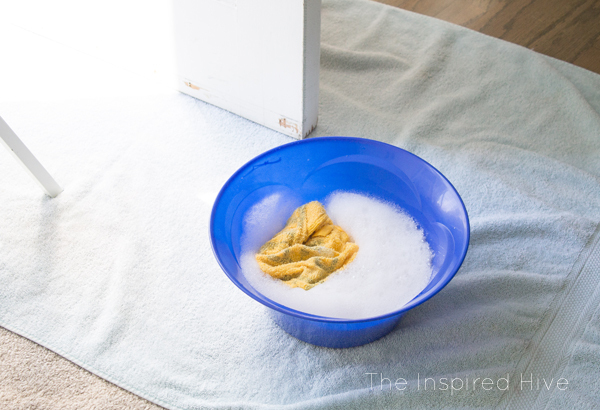 Fill a bowl with warm soapy water, and use a soft cloth to wipe down the door with the soapy water. Change out the water as needed. 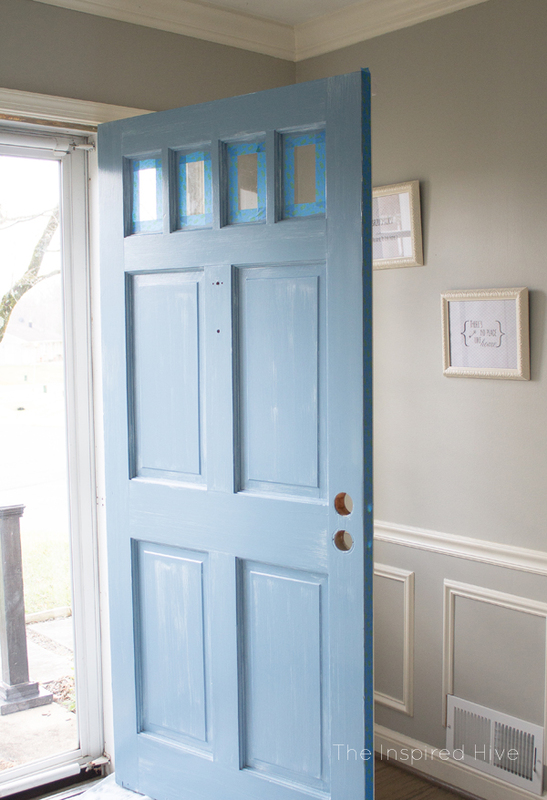 Cleaning the door will ensure that no dirt causes imperfections in your paint and that the paint sticks well. Allow to dry thoroughly before beginning to paint. 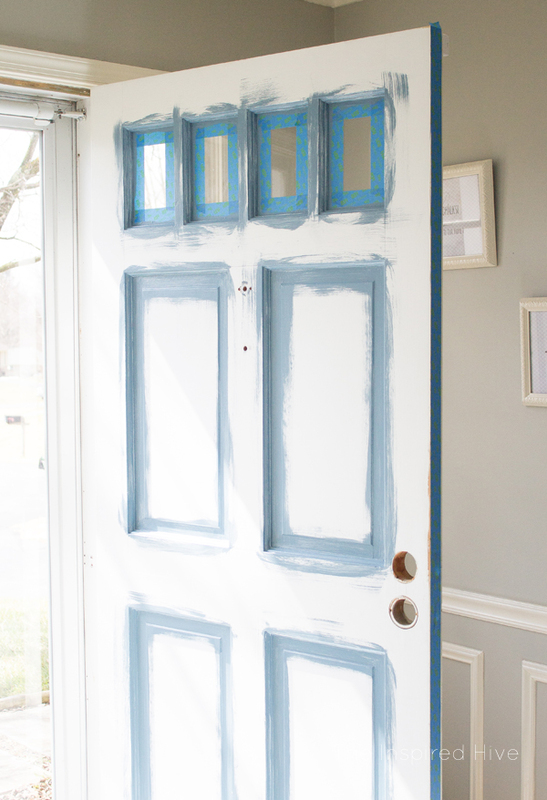 Use painter's tape on any areas you don't want to paint. I taped off the small windows at the top and also along the side edge of the door. 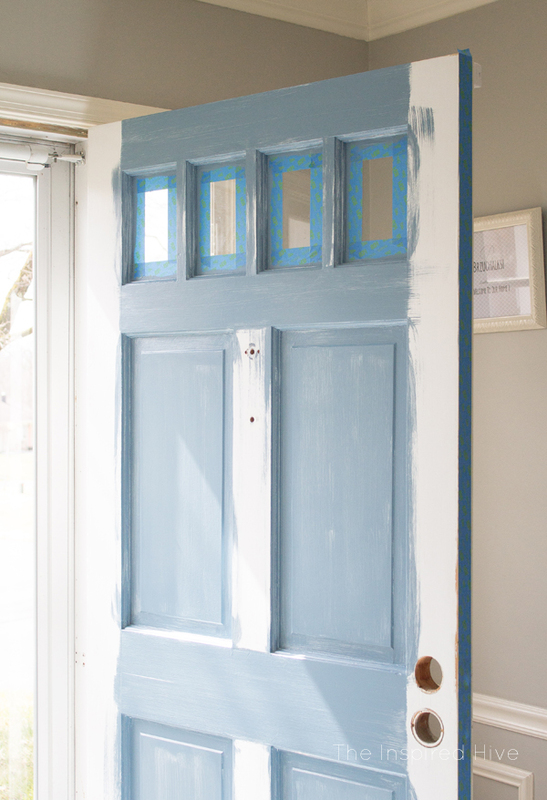 I decided to leave the interior side of the door white, so I didn't want to paint the edge of the door either. Now the fun part, the painting! Use a high quality, angled brush such as the Wooster Shortcut. The short handle on this brush gives you lots of control. I found it easiest to pour the paint into a disposable bowl to make it easy to dip my brush in. If your door has a light grille at the top, I recommend starting there. 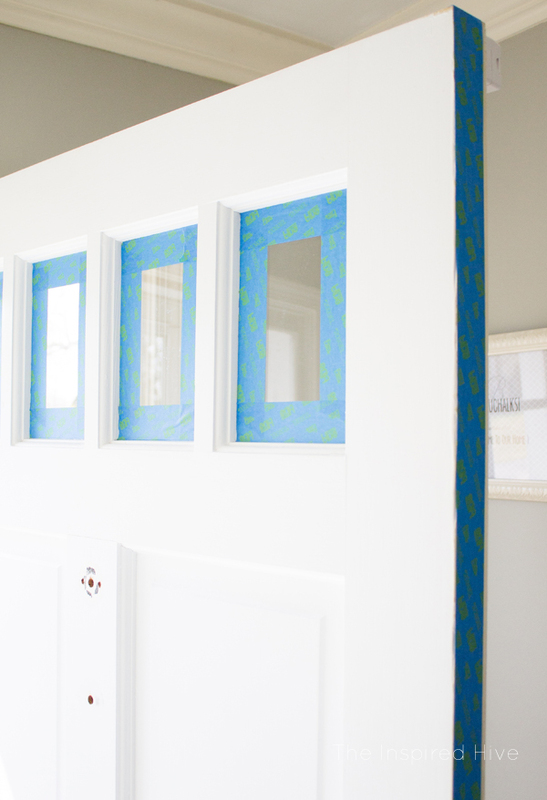 Paint the beveled edges of each window pane and in between each window. Next, I painted the beveled parts of each panel. Then, I painted the horizontal sections. While that part was drying, I painted the panels. 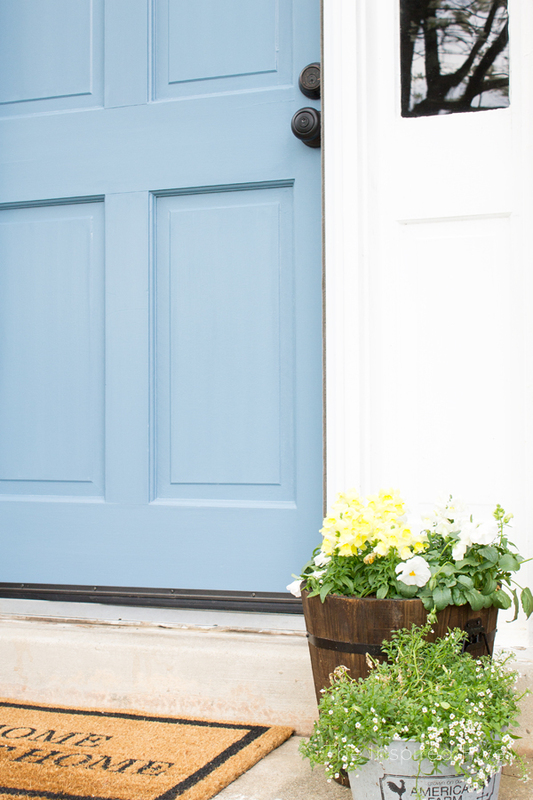 The Curb Appeal paint dries quickly, so the beveled parts of the panels should already be dry. No need to worry about messing them up as you paint the panels! Once I was finished with the panels, I made sure the horizontal sections were dry and started painting the vertical sections. I found it best to apply the paint with short brush strokes to ensure good coverage, and then to run the brush back over an entire section in one long stroke to help reduce brush marks. Overall, the paint was great at leveling itself out and not showing many brush marks. 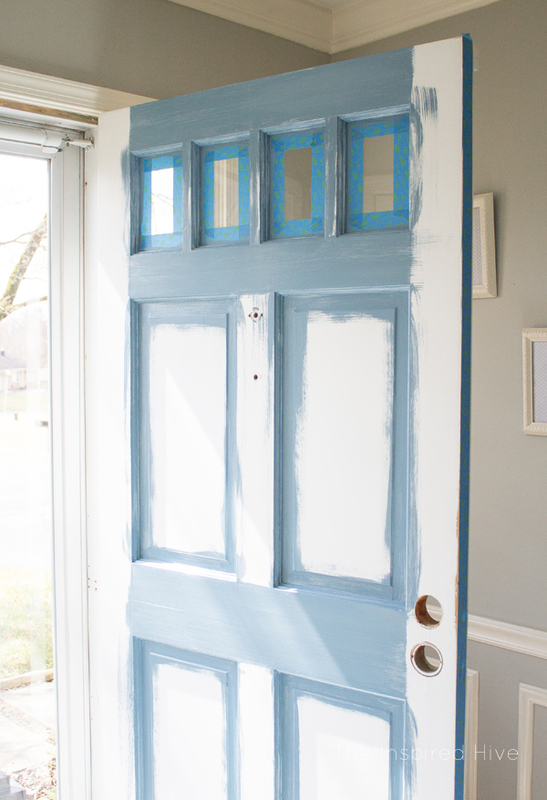 Once the whole door was dry, I gave it a second, final coat of paint. 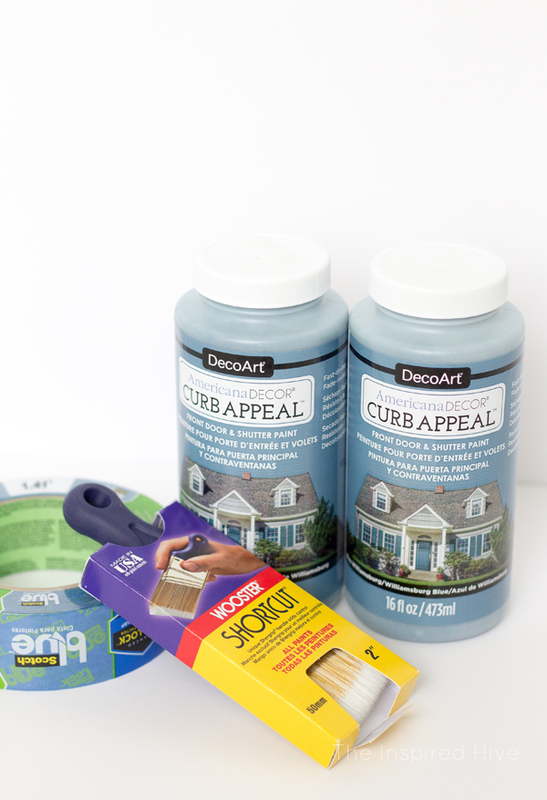 Americana Decor Curb Appeal paint dries as a durable lasting finish, so no sealer or clear top coat is necessary. Then, I reinstalled the hardware (door knocker, deadbolt, door knob). 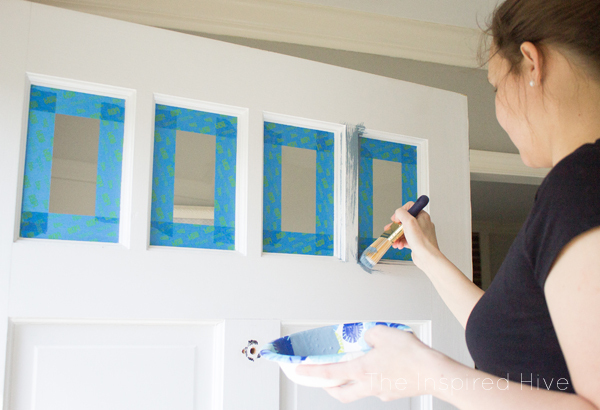 The door was looking so good, I could hardly wait to remove the tape from the glass! It's like a brand spankin' new door! 😍😍😍 But note the ugly bushes and filthy door mat. We still had some work to do! So we had the overgrown bushes removed, cleaned the front walk way, bought a new door mat, and added some planters, among other things. It looks soooooo much better, right?!?! 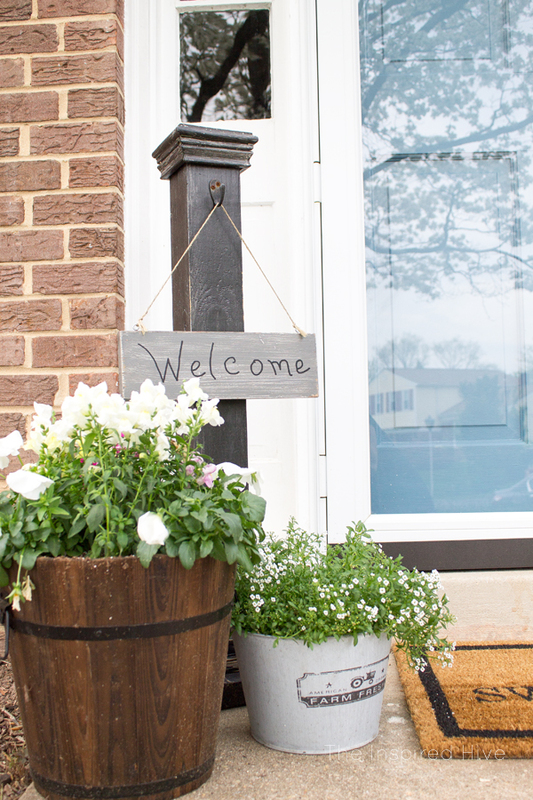 The entire front entry feels so much more welcoming and looks more appealing. Landscaping. We added some hostas, peonies, and fresh mulch in place of the bushes. The power of paint always amazes me. A few small changes and a pop of color made a world of difference in our front yard. The tours came rolling in and our home was under contract in 18 days. 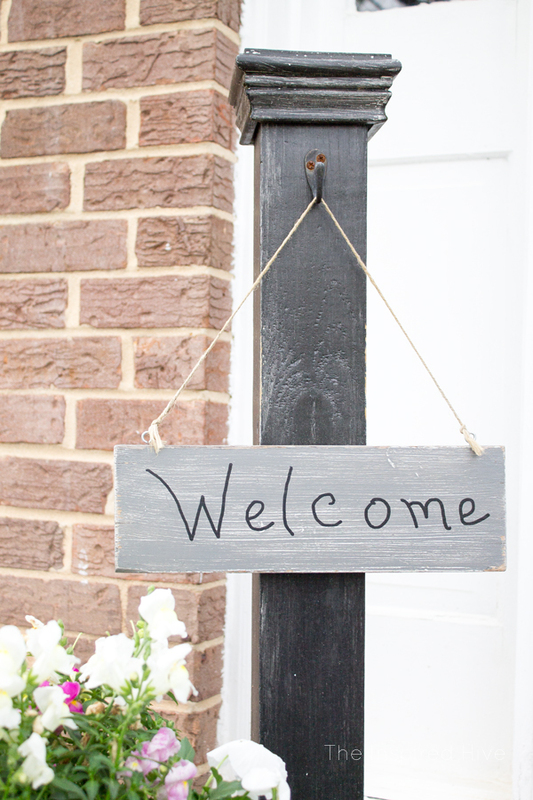 Curb appeal may not be what won them over, but I believe it certainly helped get them in the door! If you're thinking about selling your house, grab a brush and spend an afternoon adding some color to catch buyers' eyes!